Art Break Wednes…- um, Thursday: Hashtag Classic Authors! What if classic authors had used social media? I’ve had some fun with this idea creating the start to a series of new works using vintage “Authors” playing cards. 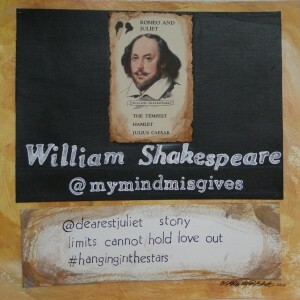 For instance, perhaps the Bard, while penning Romeo and Juliet, would have dubbed himself @mymindmisgives and sent a little message to @dearestjuliet – “Stony limits cannot hold love out” – with the hashtag #hanginginthestars. Okay, I’ve been having fun playing with vintage metal letterpress type, too. You get the idea. In my Etsy shop I’ve got a couple of the framed versions and three of the matted pieces. 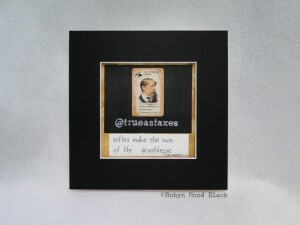 I’ll add more as I make them and want to have a nice selection of these (and lots of literary art) for my booth the 2013 Decatur Book Festival coming up Labor Day Weekend. 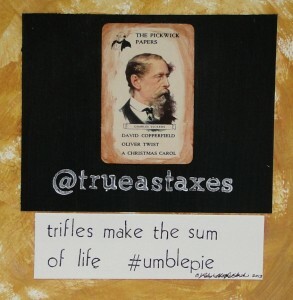 For these “hashtag classic authors,” I’m only using phrases lifted from their direct quotations and works. I hope they would get a kick out of them if they time-travelled to our fast-paced, social-media-driven lives. To see this section in my Etsy shop, click here. Enjoy, and thanks for visiting! 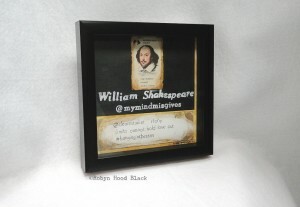 This entry was posted in Art Break Wednesday and tagged art, artsyletters, Charles Dickens, David Copperfield, hashtag classic authors, literary art, quotes, Romeo and Juliet, William Shakespeare by artsyletters. Bookmark the permalink. Oh my, Robyn, these are so clever and attractive, too. I remember playing with those cards, and now you’ve brought them into 21st century art! I also love the quotes/tags you chose. I wouldn’t know exactly what to choose for some of them! I love it! Robyn you are the best. Just curious: do you use actual old cards, or copies? Hi, Sandy! Thanks so much. I’m a stickler for the real item – something about the tangible little piece of history I can’t resist. (No copies for me!) I’ve been purchasing these from vintage dealers here and there, so I’m limited as to which authors I can play with, but I’ve got a nice little stack for more in the works. Wonderful. I’m still in the process of unpacking old “stuff” so will keep a lookout for anything that might interest you… I’m always looking for a good home for it. Clever idea!! I hope you make lots more.